@the00 – I got lucky there! Not sure what I’ll be running when the trails turn to glop. I have a set of 29 wheels with 2.3 magic mary and hans damf on. Probably start with those. Won’t be short of mud clearance. @pamp – I’m assuming some of that kit has come of a red bike 🙂 What’s the fork on that? Due to having less and less interest in racing MTB’s any more I’ve been looking into selling my 29er XC full sus bike and getting something that can do a bit of everything to replace it. I’m wondering if the SolarisMAX might be the bike to do that? For those of you that are riding one, how do they ride with shorter travel forks, something around 120mm with 27.5+ wheels? I’d also be curious to know how they ride with the shorter travel fork and normal 27.5 wheels? I might still enter the odd XC race if I can be bothered so the Solaris would still need to be a reasonably quick bike to be of any use to me. Does it fit the bill? They’re designed around a 120mm fork but rated up to 140mm. if you want 27.5 ‘normal’ size wheelset then you should look at the longshot Soul. I’m finding more pedal strikes than with the mk1 version (albeit I have shorter cranks but B+ and 120mm forks on that one). Would seem pointless to me to run the wrong wheelsize…..
Alex, fork is 140mm Yari – modded with latest air spring & neopos volume spacer. My Sonder Transmitter was the donor bike for this build & that had some red! Well chuffed after the first ride at Holmbury/Surrey Hills last Weds. Somehow the bike seems to soak up rough terrain and be calm, poised etc and so carries the momentum better. 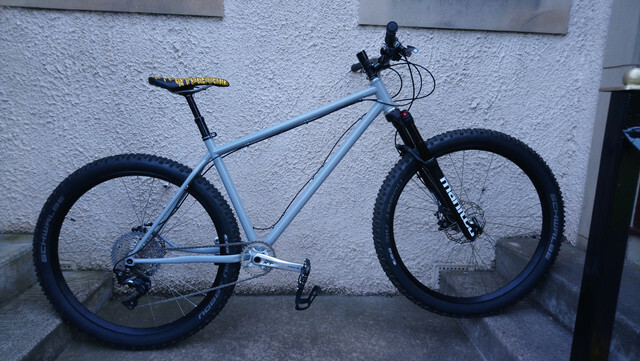 Same forks/tyres/wheels as before so it must be the steel frame magic. My last strava track resulted in 22 secs taken off a 3 minute time,….that fast feeling confirmed! @Not – I asked Cy about running with non plus 27.5 wheels and his view is the BB would be very low. First ride today, after finishing the build at 11pm last night. Not had a hard tail for some years, even so inspires confidence being nice and stable plus it’s fast and handles very nicely looking forward to getting some more miles on the bike. I was meant to ask how it rode with normal 29 wheels, not 27.5 as my original post said! Loaded up some bottles at the weekend. On my XL the bottom cage needs to be side loading, but the top one does not. Fits 2 x 750ml bottles. Gutted took too long deciding and now out of stock in Mediums and Large!! Can anyone reassure me that spending money on a basic set of 29″ wheels (and tyres, and discs, and cassette) will be worth it, and i’ll get 2 bikes for the price of one? do it all grippy hardtail on 27.5+ and xc mile muncher on 29? I have B-plus and 29in wheels for my mk2 Solaris and it really is like two bikes for the price of one (and-a-bit). I plan to get this version in the new year and do the same. Don’t buy basic 29er wheels though, at least get semi-decent ones. I’ve B+ on my non LS SolarisMAX and I’ve just finished a 300+ Km trip across the Highlands and back (including out Strathconnon and back over Attadale to Glen Ling and the Affric Kintail Way (picking up the GGW back to the coast). it was fine and I was glad of the extra cushioning of the bigger tyres. Another reason why I’m keeping both Bikes set up completely differently (otherwise i’d need to get of one or something… ). ETA: as chaka above, get at least half decent wheels. How much is a second set ordered from Cotic? That’s twice now I’ve taken this bike over my FS to the Yat (FoD) to ride the best trails over there. Lots of steppy rock, few steep bits, not entirely dry right now and – at the end – dark! No regrets, it’s proving more than a match for anything I can ride. So, um… are there any structural concerns with running it with a 100mm fork? I know the BB will be lower, and the ST/HT a bit steeper, but it works just fine. At the same time, I haven’t really had any pedal strikes, and there are bikes out there with an even lower BB (BTR Chaser lists a massive 65.5mm drop on the M). I already bought an air shaft to convert the Reba to 120, but I have another 100 fork that can’t be converted. Will I die? Hi pampmyride, forge197 & Alex – all your bikes look like small ones, correct me if I’m wrong. How tall are you guys ? 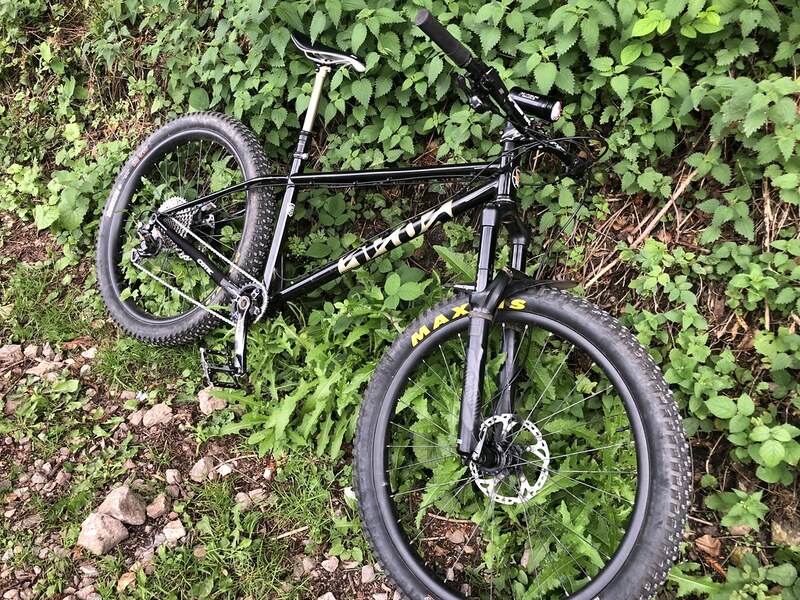 I have a MK1 Solaris in medium with a 70mm stem and would like to increase the size of tyres I can run, I’m 5’8″ and enjoy my current frame & stem. size. My issue is I’m not sure a new medium would be a good fit. Indeed mine is a small, with a 35mm stem, I’m 4” shorter than you, your probably right on the edge of small or medium. Be worth seeing if you get to a demo day Cotic have a few coming up and try both sizes as your height puts you in range of both small and medium on the MAX, they are long top tube so you may get away with a small with longer dropper, but that is something you’d want to check is comfortable. For what it’s worth, I used to have a small Mk1 with a 90mm stem and now I’m on a medium with a 35mm; 5’8” also. No wonder I’ve said my Solaris feels short at times. I’m 5’11” and a half and have a medium mk1 with 60mm stem (740mm bars). The whole LS geo thing is based/designed around a long top tube and short stem. It doesn’t ‘feel’ as radical as it sounds, it feels pretty ‘natural’ right from the off (well it did for me). Thanks for the replies I’ll keep an eye out for a demo in my area. Mine’s a medium. I had a MK1 medium that was probably a bit small, a Mk1 Solaris for my daughter which was a bit short and this one which is perfect 🙂 I’m 5ft11 so on the edge of a M and a L. Had a chat with Cy about it and for the type of riding I do, decided to stick with M.
Oh it’s fitted with a 50mm stem and 780mm bars. Just to clarify my mk1 is an original not a mk1 Max. kd48, yes mines a small & I’m about 5′ 7″. I checked the dimension charts comparing my Sonder Transmitter to the Solaris Max and the small was closest. Shoving saddle forward gives the fairly upright stance this old git likes! 3 rides so far & I’m smitten. Second ride out today, changed the wheelset as had some issues with the last set, it’s a very confidence inspiring, it’s exceeding the expectations I had. Great fun bike, carry’s so much speed and so stable. How does it climb forge , are you able to put some effort in and it accelerates uphill? Or is it sit and spin away? On loose stuff up hill it’s got so much grip you can just sit and spin, equally I did stand up and pedal up a loose climb and all good if does both well, it feels more natural seated but responds well and seem fast enough up hill, and it’s not draggy which I expected I run around 20psi or a touch under back and front It will accelerate up hill and will respond as such seated or standing. I am more of a sit and spin rider that up on the bars, I’ve climbed around 1950ft today at Nant Yr Arain and it climbs brilliant, I’ve not had it long but so far there is very little to fault it’s quite an incredible bike I am amazed how good it is, I never thought I’d have a hardtail that is both comfortable and that you don’t need to find the smooth line you can take the line you would on a full suss up or down. The grip it has on berms and corners with the wide tyres is comical really and the STW review is right you do sometimes arrive with a touch to much pace. Disappointing test at the weekend. The Lezyne Flow side loading cage is unable to hold a bottle on rough ground, or even when the bike is lain over or stood on it’s back wheel. It will be returned. I have fitted a normal cage in the lower position, which is actually fine – I just need to the remove the top bottle first. This is ok – have the top bottle as the one in use, and then just swap over when empty. Bike is still awesome, but I need to do some fiddling on the forks to improve small bump sensitivity in turns. Climbing prowess and stability is impressive. the STW review is right you do sometimes arrive with a touch to much pace. This, very much this. I think I’m not going that fast and then I hit the brakes to stop…. and find out I’m going a good bit faster than I thought…! Specialized (swat compatible) side loading cages here… they work brilliantly. I use one (upside down) on the Rocket as well… never lost a bottle. Just got mine built up today. Good golly it’s long…. and slack…. Only been round the block but it feels super stable and dare I say it ‘confidence inspiring’. The one thing that put me off buying this frame was the fugly dropper cable routing up the down tube. Does anybody have any advice for the prettiest way to keep the cable taught so it doesn’t turn into the Loch Ness Monster? You would have though given the price they could have worked out a better way of doing it. Fresh housing outer? Mine lays straight just fine. Fresh as in new? My dropper is straight out of the box…. I would of course post a photo but still can’t work out how to do it. Anyone got a pic of an XL built up? Those are all with 29×2.4 tyres btw. I have dropped the rear tyre size down a bit now. XL in new improved colour scheme (I really didn’t like the green) with 29×2.6 Nobby Nics.